Did you know that our Mindful Chili Sauce make a wonderful base for cooking your meal? Heat up the pan with oil. Add Mindful Chili Sauce and stir until sizzles. Add Brussel sprouts and Mushroom, add salt to taste and stir. Bring the heat down to medium, don’t cover the lid and just allow the mixture to cook until its done. Taste and add extra Mindful Chili Sauce as needed for your preference. Did you know that we infused our Mindful Sauce with healing intentions? Visit here to learn more about the mantras. 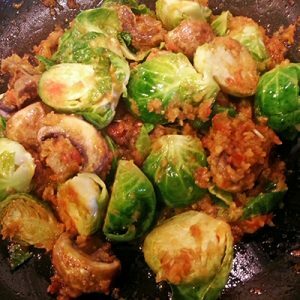 brenpa's kitchen, brussel sprouts, Mindful Chili Sauce, mushroom, protein, recipe, vegetarian. Bookmark. Missing That Mindful Chili Sauce In Your Life?